A bike specially designed with tires that are 3.5 inches wide or wider to float on snow. Rims range from 60mm to 110mm wide, and tires that run on LESS THAN 10 psi. Mountain bikes are not recommended on trails unless the race description is modified due to lack of snow. If your groove is deeper than a half inch, air pressure should be reduced. This will enhance your experience, as well as protect the trail for other users. All riders are strongly encouraged to reduce air pressure. If you ride in an area with little snowfall and rock-hard groomed trails, your “high pressure” tires (7-10 psi) are NOT the right tool for the job here. You will encounter soft, deep snow the likes of which you may have never seen, and a properly aired-down tire (3-6 psi) will float and grip, while a 7-10 psi tire will definitely sink and spin. Bikers must walk their bike to the designated start line near the Manito-wish Leadership Center/Transition Area. On returning from the biking route, participants must again run or walk their bikes from the woodland trail exit through the finish line. ALL PARTICIPANTS MUST START AT THEIR APPROPRIATE START TIME at the starting line near the Manito-wish Leadership Center. The start-line will be clearly marked. The course is throughout Northern Highland-American Legion State Forest trails, some of which are along Boulder Lake, and in the woods around Camp Manito-wish YMCA. Estimated completion time for each leg is approximately 30-60 minutes depending on your ability. *Trail conditions will depend on snowfall and temperatures in the weeks and days leading up to the event. Take a ski on the wild side – the ski course is a wilderness trail that is deceptively tough and incomparably beautiful – glimpse the Manitowish River and Boulder Lake through the tall pine trees, watch for deer, snowshoe hare and other wildlife tracks while breathing in the fresh unpolluted air of the Northwoods. Waves consisting of 2 triathletes will be released every 30 seconds at the start line. Your first .10K is downhill with two single tracks that merge into one. For the first 1K of the race you’ll go through the campus where the trail is narrow (single track) with tight turns around buildings and trees – there will be little if any chances to pass other skiers. Be patient and practice good sportsmanship while you enjoy the views of historic Camp Manito-wish YMCA which is celebrating their 100th year. After the 1K point, you’ll enter the Northern Highland-American Legion State Forest where the trail will widen to accommodate both classic and skate lanes and allow for passing. The terrain is gentle – curvy and mildly hilly but still challenging to race. There will be an aid station with water and sports drink around the 3K point. You’ll cross trails with the snowshoe course at two intersections – skiers will have the right-of-way. The only semi-big hill will be at the 4K point and shortly after that you’ll get a view of the Manitowish River on your right. At 6.5K you’ll cross the main road leading into camp, volunteers will make cars yield to skiers to ensure your safety. At 7.5K you’ll ski through the camp’s ropes course and be back on the narrower campus trails. 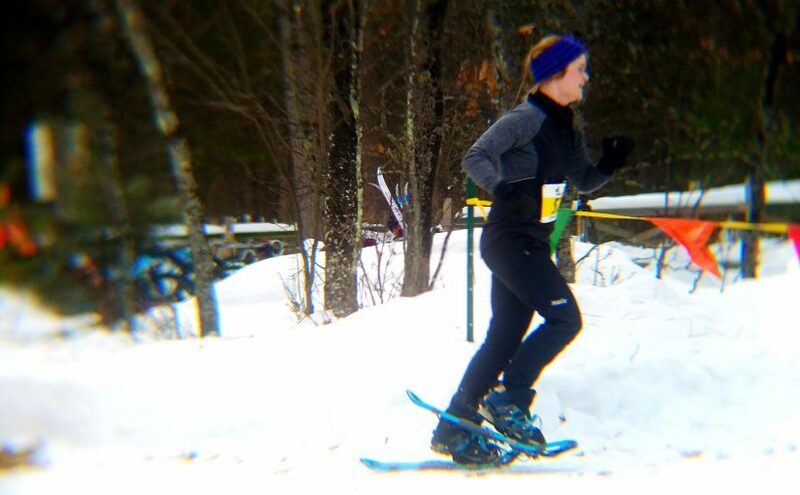 After you finish the course by passing through the timing arch, take a moment to pop out of your skis to run over to the transition area which is blacktopped road that may not have snow cover. The snowshoe course is beautifully rugged – winding through the woods on a combination of ungroomed single-track sections that could be powdery and groomed 10-12” wide ski trail sections. Watch for low hanging branches and uneven terrain in some tight spots. After taking off skis and ski boots and changing into your boots and snowshoes (we recommend you wait to put your snowshoes on until after you are out of the blacktopped transition area and back on the snow), you’ll leave the transition area and start the snowshoe course in the same location where you began the ski. After taking a sharp left at the bottom of the hill, you will cross a frozen bog to get back into the woods trail. Around the 2K and 2.5K points you will cross the ski/bike course -snowshoers must yield to skiers and bikers. At the 2.5K point you’ll be able to see Boulder Lake as you take a short loop near the wilderness campsites. At the 3.5K point and until the end of the race, the trail is 2-way and you will need to follow trail etiquette when passing other snowshoers. The fat tire bike course uses the ski course. By the time the bikers hit the trail, all skiers should be finished and onto the snowshoe course. We cannot control the weather and the course conditions can vary widely, from hard packed to soft powder or “mashed potatoes.” Riders are expected to be familiar with biking on snow and have appropriate equipment. Bikers should stay off the classic ski tracks when possible. 3-Person Relay Teams: Skiers will begin the race with the full triathlon at the designated starting line. Once you complete this ski leg and pass through the timing arch and reach the road (which is closed) you will need to meet your snowshoe partner at the flagged area near the starting line and touch tag before the snowshoer begins. After you complete the snowshoe leg and cross through the timing arch, meet your biking partner at the flagged area over by the start line and touch tag to start the biking leg. Safety: Race sweepers will be out on each course to make sure all triathletes finish safely. It is your job as a participant to help another racer if they are in distress and need help. There will be first aid at the Leadership Center and a warming hut/aid station #51 on the course at the intersection of the ski/bike and snowshoe course – report an athlete in distress to any race volunteer. In an emergency situation, call 911. Withdrawing From The Race: If at any time you cannot complete the race for any reason, you must let a volunteer know so that we know you are safely off of the course and back at Leadership Center. If you are unable to make it back to the Leadership Hall Center on your own, you may wait at the aid station at #51 for a ride back via snowmobile after the race has completed. OR you may notify a race sweeper and they will make arrangements for a volunteer to meet you at the EMT station at trail intersection #45 who will give you a ride back to the Leadership Center. Respect the Tracks: All courses will be set with classic track for the entire length. Skaters, please do not stake across the tracks if at all possible! Bikers, please stay of the tracks as well. Passing: Use your voice when passing to alert the other triathlete you are passing, then do your best to pass quickly. Conversely, when being overtaken by a faster skier, move out of the way and double pole if possible to allow the faster skier to pass. If in the tracks and you hear “Track!” behind you, move out of the tracks to allow the faster skier to pass, then move back into the tracks. If you want to pass someone in the tracks, either yell, “Track!” or move out of the tracks and overtake the skier in front of you. Trail Preview: Conditions permitting, trail preview is from 1pm to 4pm on Friday, February 14. We will be grooming the course Friday evening and do not want racers using the trail after final grooming. Warming Route: Due to logistics at Camp Manito-wish YMCA, we are not offering a warming route on-site. The parking area is 1/4 mile from the staging area so you will have an opportunity to run for warm-up if you would like, or off-site trails could be used prior to arrival.